One of the ways I save money on leisure and entertainment is to spend time outdoors. Not only can I avoid spending money but I also get exercise and enjoy time with friends and family. Finding free things to do outside allows me to increase my net worth and my well being. According to an article in Inc. on how wealthy people spend their weekends, planning and anticipating fun, unplugging from screens, exercising, spending time with family and friends, pursuing interests, learning something new, and going someplace special are key items on their to-do lists. Certainly, I could pay for activities — by staying at a bed and breakfast, going to the movies, or paying a private instructor to teach me a new skill. But doing free things outside just as easily aligns with the ways successful people use their free time and it's friendly to my budget. Walk in architecturally interesting neighborhoods. Stroll in a big city, take some time to enjoy mainstreet in a small town, or walk around an area with unique home and building designs. Go for a walk in a local neighborhood. Stop and talk with neighbors, get landscaping ideas, or pick up tips for growing my garden along the way. Ride my bike on the road. Road cycling isn't for everyone but after paying for a bike and helmet, riding on the roads can be a free source of fun. Find out about rides and routes through local cycling resources that include cycling clubs, bike shops, and informal cycling groups. Take a free walking tour of your town or a tourist locale. When I visited New Orleans over the holidays, I downloaded free audiotours through the tourism bureau's iPhone app and learned about the French Quarter and City Park for free while exploring the city on foot. Run or walk with a friend on paved trails at a local park. In my area, I go to a smalltown park, a county park, and city-maintained greenway to run, walk or walk/run on a regular basis. Watch fireworks displays. This activity is limited to special occasions (such as Independence Day and New Year's Eve). But, when offered, it's easily enjoyed with family and friends. Attend a parade (or be in one). Arrive early for a parade to snag a prime viewing spot and enjoy. As an alternative, I've appeared in a local town's parade by serving as a chaperone for my son's marching band. Bike on rails-to-trails trails. Many towns and cities have trails that have been converted from former railways to multi-use trails. Find one by searching TrailLink.com. Visit local gardens with free admission. Major cities (and small ones too) may house sculpture or cultured gardens. Train for a 5K or a longer distance race. Get a free training plan online from Hal Higdon, Jenny Hadfield, or another source. I often run on a paved trail, horse trail, or mountain bike trail to get ready for races. Take photos. I'm not an expert photographer but I like taking pictures outdoors. I might snap photos of interesting architecture, special events, sunsets, sunrises, moonrises, and more. Dance at a live (free) concert or just listen to music. It's unlikely that you'll find me dancing outside in public. But someone could do this — for free. Look for admission-free events sponsored by a local municipality, perhaps at a downtown street venue or a town square. Play in the snow. I love walking in the snow, particularly before the streets have been cleared. My short treks in the snow are fun, freezing, and free. I might also build a snowman or go sledding. Take a university tour. Many college campuses are very walkable. I enjoy wandering around, learning about a university, people-watching, and getting some exercise. Wander around historical areas. Walk on cobblestone streets in an 18th century settlement like Old Salem or ride a bike in trails around battlefields like Valley Forge National Historic Park. Tend a garden. There are many options here: I can take care of my own garden, participate in a community garden, or help a friend with his or her garden. Not only could I spend a few hours encouraging growth, I might deepen bonds with friends and reap fresh fruit and vegetables. Pick fruit. Fruit growing in public spaces may be available to anyone for the picking. My local greenway boasts wild blackberries, for example. Learn an outdoor skill. Many state parks offer free sessions on outdoor-related skills such as how to fish or use a compass. Ride a mountain bike on trails. Many of my road-biking friends also have mountain bikes. Trails can often be found in state, county, and city parks. Go cross-country skiing or snowshoeing. Friends in the midwest tell me that cross-country skiing and snowshoeing are regular winter pasttimes. When they can't go hiking, they get outside with their winter gear. Look for birds. The greenway with the free fruit is also a great place to go birdwatching. I often see groups on Saturday outings as well as individuals with binoculars scoping out small creatures. To equip myself with knowledge about birds, download The Audubon Bird Guide App (free). Gaze at stars. Find a quiet place void of manmade light and enjoy the tranquility of looking at the night sky. To learn about astronomy through an organized program, check out park offerings like this one in Bryce Canyon National Park. Hike at a state or national park. One of my favorite weekend activities is hiking at a state park or the Blue Ridge Parkway about an hour from our home. My husband and I enjoy both easy hikes of a few miles and longer, more challenging ones of several miles. To find a trail, I might ask friends about their favorites or check out the National Park Service or my state's park system website. Not everyone who plays outside is rich. 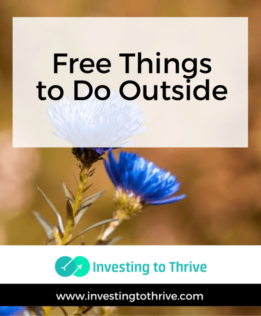 But I've noticed that many people who are able to accumulate wealth get there by enjoying free things to do outside and minimizing cash outlays associated with their leisure activities. They may need to make an investment in special equipment, such as running shoes, hiking boots, snowshoes, a bike, a boat, or binoculars for birdwatching. But after buying basic tools for their activities, they can spend nothing and delight in outside experiences. That's not to say that I must enjoy the outdoors to save money. I could just as easily immerse myself in a hobby, read a book from the library, or run a side business that I truly enjoy and derive many of the same benefits. For simple ways to control my budget and improve my lifestyle, I often do free things outside. Julie, I just bought your book on the TMB. I want to ask you what you purchased as rescue insurance in case someone broke their leg over there. You mention in the book that you bought it, but you don’t say who the vendor was. I am having trouble lining up such insurance for my TMB in July.